The connection: Ralphie turns the big ONE-FIVE today! Veteran mofoers! 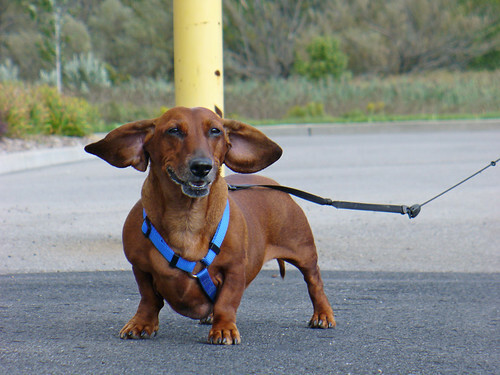 Maybe you remember Ralphie the wiener dog? Since his birthday almost always falls during Vegan MoFo, he’s made at least one appearance every year since I started participating five years ago. And the one year Vegan MoFo was observed in November? 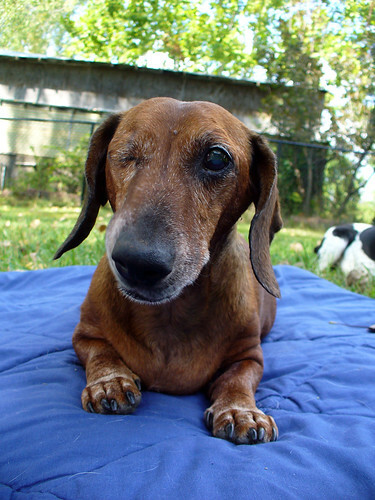 He had his eye removed that month! Naturally, mom plied him with delicious foods to ease the pain. 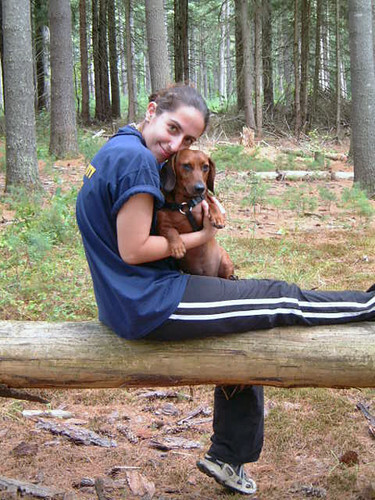 Though The Vegan Cookie Connoisseur is 99.999% people treats, Kelly Peloza was thoughtful enough to provide a recipe for our canine friends too! These Peanut Butter Dog Treats are super-easy to make and consist of just a few wholesome ingredients (namely, whole wheat flour, oats, peanut butter, and water). The dough isn’t really meant to be rolled out for cookie cutters – it’s kind of thick and not very stretchy – but I just bought a few new sets that I was dying to use, so I gave it a try anyway and guess what? SUCCESS! For three go-rounds, then I threw in my rolling pin and shaped the rest into little discs by hand. Which is really better for tiny dog mouths, but not nearly as pretty for pictures. I mean, look! 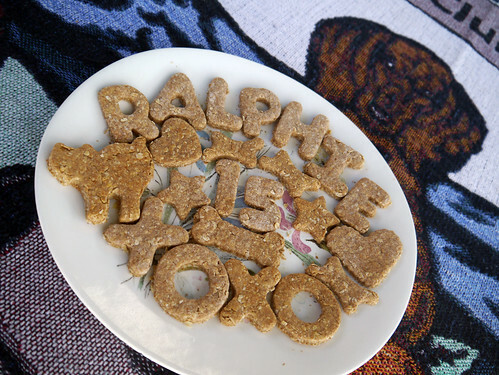 I was able to spell out Ralphie’s name and his age, throw in a few hugs and kisses (xoxo), and even make some hearts, stars, and bones. Adorable right? 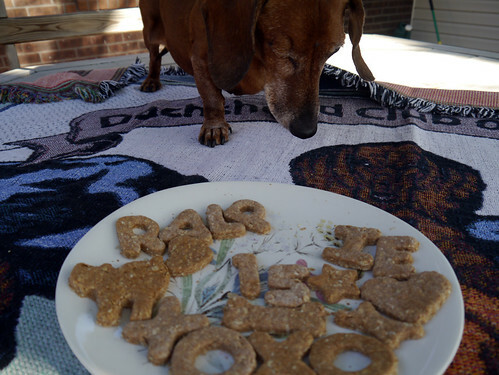 I tried taking some pictures of Ralph with his giant platter o’ biscuits, but he wasn’t in an especially cooperative mood. Not surprising, since there was food on the table. I snapped a few quick shots before he grabbed the one and only “H,” effectively ending the photo shoot. 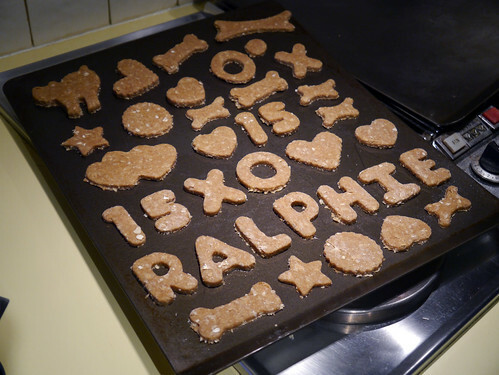 I mean, “Ralpie?” Who the eff is that? In keeping with our new birthday tradition, here are Fifteen Little Ralphie Things, one for each year of his life on this marble we call Earth. There are so many more things I love about him – try kajillions – but these are just the first fifteen to come to mind. I love you, little guy. Now and forever. 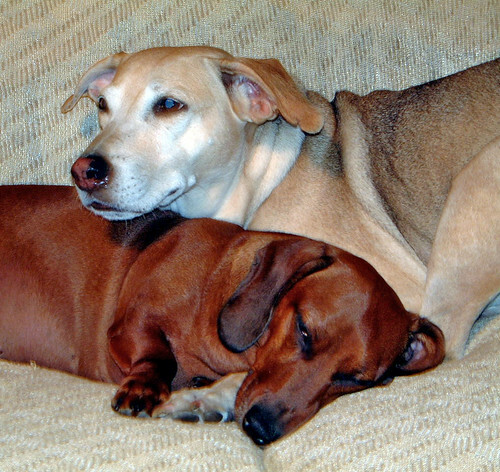 This entry was posted on Wednesday, October 10th, 2012 at 12:15 pm. You can follow any responses to this entry through the RSS 2.0 feed. You can leave a response, or trackback from your own site. 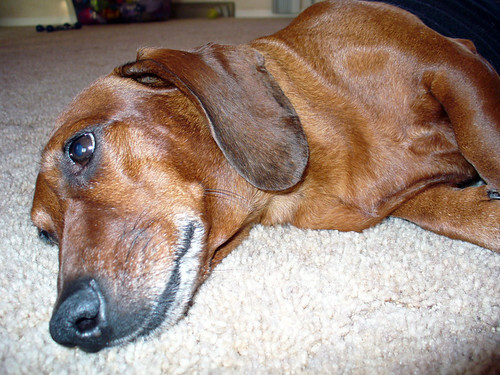 Oh my gosh Ralphie is SO adorable. When I was little my babysitter had a dog named Ralphie and I had a song I’d sing to him called “Ralphie’s so handsome” and I immediately thought of it when I saw your guy. And those treats look great too! 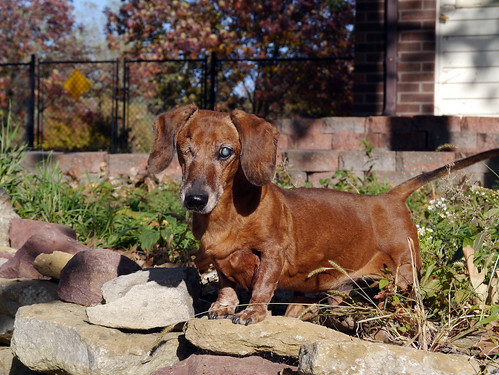 He looks like such a happy dog even with his eye problems. 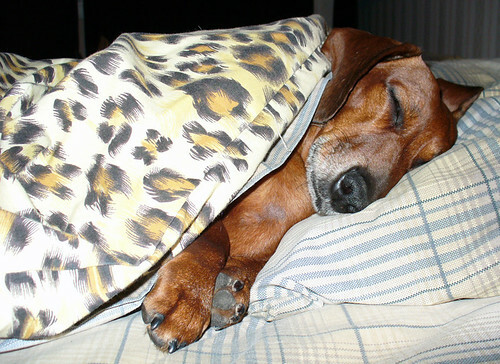 OMG Ralphie is SO precious! 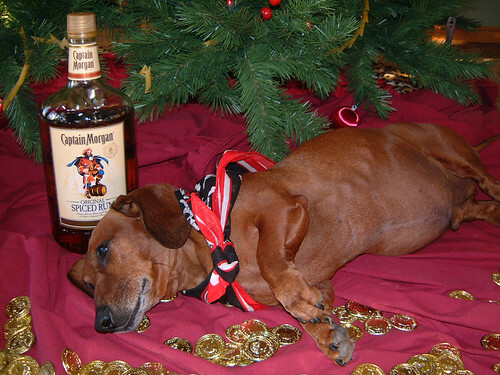 I have a 5year old sausage dog and she has lots of things in common with him :) I need to try those cookies. What food do you feed Ralphie? What a great post. 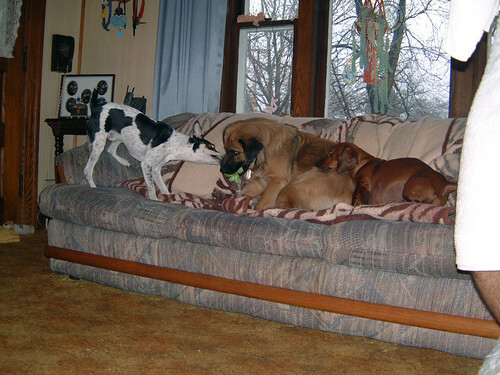 I laughed reading some of the things about him, especially how he only wants toys when other dogs want them. Rowan’s like that! Lots of kisses to him! Aww, this is such a sweet post. 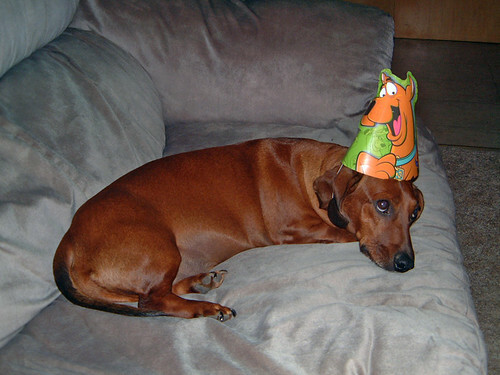 Happy birthday Ralphie! @ Anne – I tell my cat Lemmy that all the time (he’s the one cat in a house of seven dogs, so I think he’d suspect anyway), but your secret’s safe with me! Hey Federica! 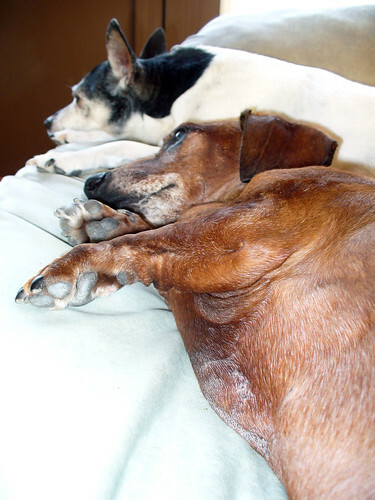 The dogs all eat the Natural Balance Vegetarian Formula, with some homemade food mixed in for volume and variety. Sometimes it’s as simple as canned veggies, but usually I make it more interesting. (The current fresh food is baked apples with tofu.) I also give them homemade peanut butter balls twice a day – perfect for hiding pills! What a pretty pup! I love this post :) He deserves that H and all the rest of the letters! 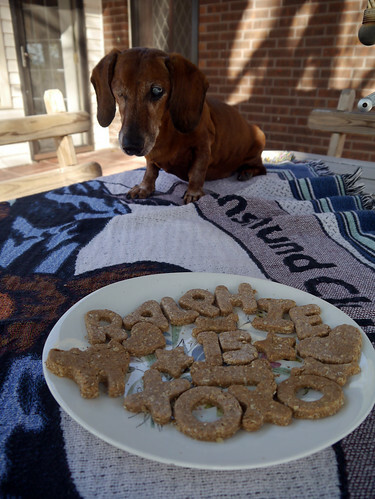 I have one eye, just like Ralphie<3 PB dog treats sound great! They aren’t half bad, Jenny! Yes! 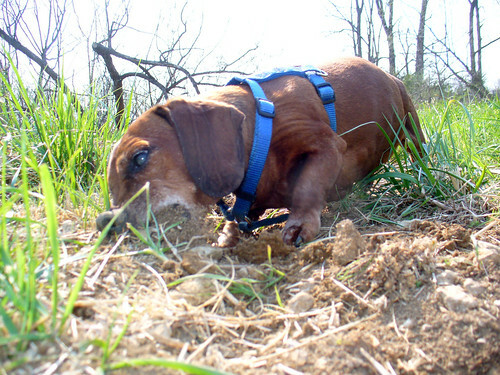 Finally something about molly’s dog treats.